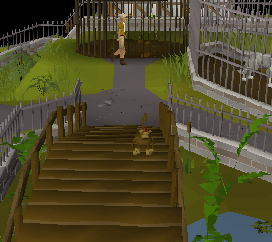 Monkey Greegrees are magical items which can be equipped on Ape Atoll and in Ardougne Zoo and turn you into a monkey. 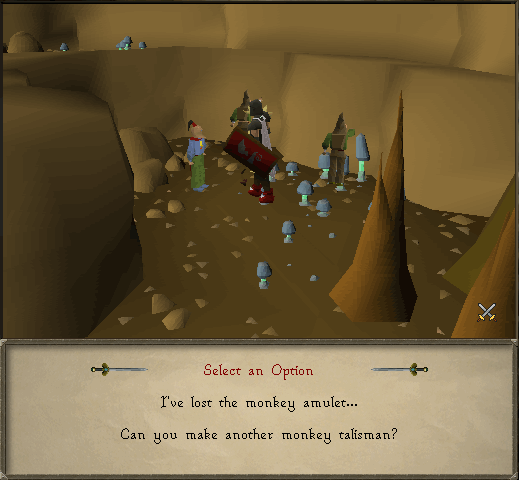 They are used mostly during the Monkey Madness and the Awowogwei part of Recipe for Disaster quests. But they are also needed to walk around safely on Ape Atoll, buy from the stalls there or to train agility on the Ape Atoll agility course. To make a Monkey Greegree you need two items, a Monkey Talisman and bones or remains of the monkey you want to make a Monkey Greegree of. A Monkey Talisman can be bought from Tutab's runes stall on Ape Atoll for 1,000gp. You need to wear a M'Speak Amulet and a Monkey Greegree in order to buy anything on Ape Atoll. We will go into more detail about how to get the needed monkey bones or remains in the rest of this guide. 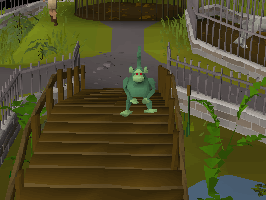 To turn those two items into a Monkey Greegree you will need to bring them to Zooknock, the gnome squadron mage from Monkey Madness. 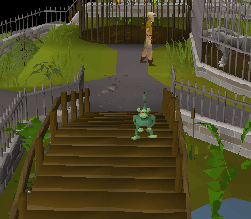 Zooknock can be found at the end of a long dungeon filled with nasty creatures and traps just like in the Monkey Madness quest (see the Zooknock Dungeon guide for more info). Don't forget that you won't be attacked there when in monkey form but you will still get damaged and poisoned from falling rocks and traps. 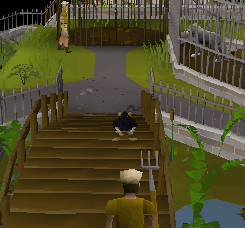 Once you have safely reached Zooknock with the needed items ask him to make you another monkey talisman. He will ask you to bring him a Monkey Talisman and some monkey remains. Use both the Monkey Talisman and the set of Monkey Bones or Monkey Remains with him. Make sure you don't accidentally bury the bones! And then you will have your brand new Monkey Greegree! Examine: A magical talisman in the shape of a Karamjan monkey head. 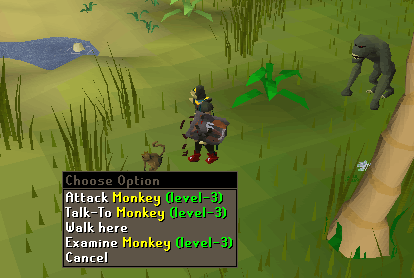 Monkey: Monkey (Level 3 melee), located on Karamja Island. 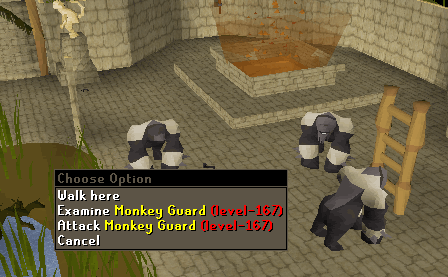 This greegree is the one needed to complete Monkey Madness and it is by far the easiest to get. 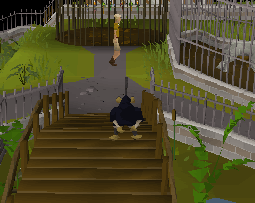 Just kill a Monkey on Karamja and pick up the remains. 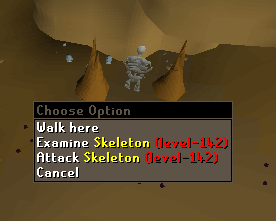 The remains can be either Monkey Bones or Monkey Remains depending on whether you did the Tai Bwo Wannai Trio Quest or not, this does not matter. 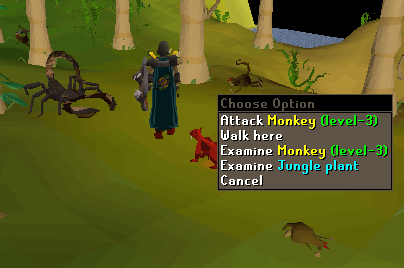 Note that if you didn't finish Tai Bwo Wannai Trio yet you won't be able to melee the Monkeys. You will have to use either range or mage to kill them in that case. Examine: A magical talisman in the shape of a small ninja monkey head. Go upstairs in one of the buildings on Ape Atoll in monkey form and head for the roof. 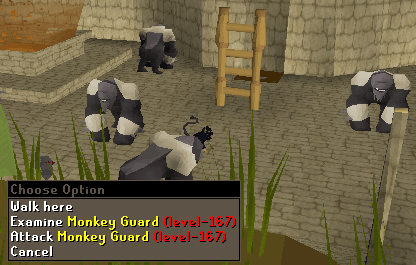 Move up to an archer monkey and turn on Protect From Range Prayer then equip a weapon (this will unequip the monkey talisman and thus revert you to your normal form). Attack the Archer Monkey with the attack style of your choosing, it doesn't really matter. 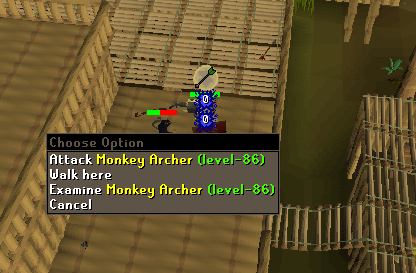 After you killed him pick up the bones and move until you aren't under attack anymore by other Archer Monkeys. Usually this means going inside the building again. Then turn back to monkey form and go restore your prayer in the temple. Examine: A magical talisman in the shape of a medium ninja monkey head. Padulah can be found on the central square of Ape Atoll. It is a unique monkey hence he has a real name rather a general type for a name. He is trickier to kill than the archer monkey because he is surrounded by several Archer Monkeys. 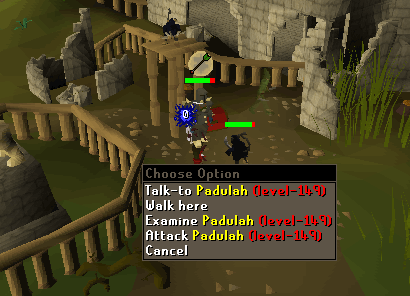 The advised way to kill him is using melee with good armour and weapons with Protect From Range Prayer turned on. 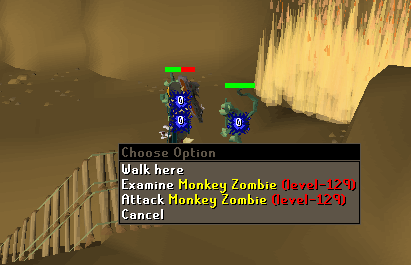 Just move up to him in monkey form, turn your Protect From Range Prayer on and then equip a weapon of your choosing (Super poisoned dragon Dagger, Abyssal Whip, Dragon Scimitar, ...) and melee him. Don't forget to take some good food with you and maybe a prayer potion if you think you'll need it, he can hit rather nasty himself. After you killed him pick up his bones and run into the long grass until you aren't under attack anymore and turn back into monkey form. Examine: A magical talisman in the shape of a small zombie monkey head. 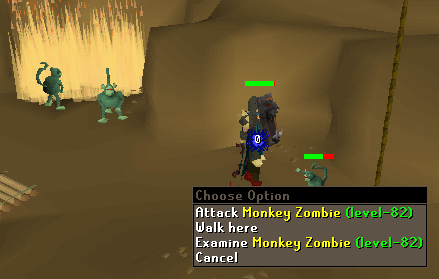 You can find the small Monkey Zombies in the basement of the Ape Atoll temple. They are easy to kill with either range, mage or simply melee. Use the Protection From Melee Prayer if needed. Don't forget it is a multi-combat area and that there are poisonous spiders around who can poison you through prayer. Also don't forget to turn back into monkey form before you go upstairs in the temple again or you might get trapped by the gorillas and be killed. Examine: A magical talisman in the shape of a big zombie monkey head. Monkey: Monkey Zombie (Level 98 melee) or Monkey Zombie (Level 129 melee). 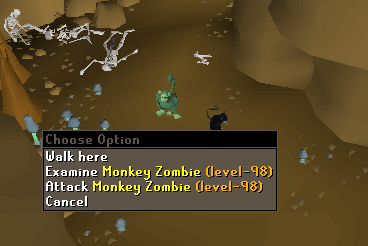 You can find the level 98 monkey in the Zooknock Dungeon, the level 129 you can find at the pyres underneath the Ape Atoll temple where you already found the Small Zombie Monkeys. You can kill them on either place but it is the easiest to kill them while going to meet Zooknock to get your bones and Monkey Talismans made into Greegrees. They aren't that hard to kill, especially if you use the Protect From Melee Prayer. While your are fighting them in the Zooknock Dungeon make sure you are standing under a ledge or you will get hit by falling stones, which damage you through prayer, while fighting. Examine: A magical talisman in the shape of a gorilla head. 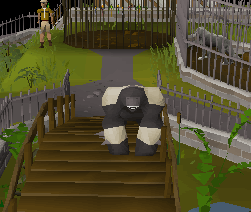 You can find both kinds of gorillas in the Ape Atoll temple. you will notice that some gorillas have a beard and some haven't. This is the only difference between both kinds, both have the same name and stats. Killing these gorilla's is trickier than it seems at first. First of all you need the Protection From Melee Prayer and Anti-poison Potions. There is an altar nearby so you won't have to worry about getting killed if you don't forget your Anti-poison Potions (the small spiders poison through prayer!) and don't venture too far away from the altar (they can block you much like barricades in Castle Wars or certain monsters in Pest Control). The hard part here is the fact that the gorillas regenerate when their Life Points have dropped to a low level. The trick is to hit them hard and fast when they are at 1/4 of their Life Points. There are several ways to accomplish this. The easiest way to kill them is to get yourself a Dharok Barrows set, let them hit you until you are at low Life Points (they don't hit over 160 Life Points) then turn protect from melee prayer on and just kill them in a few blows. But this option isn't open for everyone and can be rather dangerous since it might get you killed when your timing isn't exactly right. Another way is to hit them until they are at approximately a quarter of their maximum Life Points and then use 4 Dragon Dagger special attacks on them in quick succession killing them off before they can regenerate. Another way especially for the lower levels is to call in the help of some friends and all use your special attacks (if any) or hard magic spells at the same moment when the gorilla is at 1/4 of his maximum Life Points. The bones will appear for everyone when they aren't picked up immediately so with a bit of teamwork everyone can get his set of the most wanted monkey bones, the Gorilla Bones. Examine: A magical talisman in the shape of a bearded gorilla head. See the above paragraph for details as it is exactly the same way as the normal Gorilla. Just make sure you get one with a beard shown on the picture above. Kruk is the monkey that tells the monkeys to open the gates when you approach them in monkey form. You can find him next to the gates over the bridge. 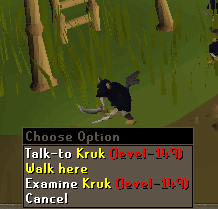 Kruk's examine info says he is a a Large Ninja Monkey but sadly there is no attack option for him. So it is just Jagex teasing us. 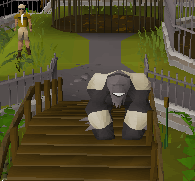 In the Zooknock Dungeon you can see skeletons in the shape of a gorilla, sadly the bones dropped by these are normal bones and thus can't be made into a Monkey Greegree. Sadly, bones of this light brown monkey on the Mos Le'Harmless island will give you a Karamjan Monkey Greegree.